The effect mechanism of Anastrozole from Balkan Pharmaceuticals is fundamentally different from the known Tamoxifen which blocks the only estrogen but doesn’t stop the process of aromatization itself. This drug prevents only aromatization; consequently, the estrogens in the organism are not synthesized and are not produced. One-time administration of Anastrozole of 1 mg provides a decrease of estradiol production in blood by 80% within first hours after being applied. First drugs of such type were designed practically simultaneously with Tamoxifen, in the 1980s in the United States. From that time by 1995 third generation of aromatase inhibitors appeared to which Anastrozole and its analogs (Arimidex) are included and their sale started. In medicine, they are used at malignant neoplasm of breast, with high activity of estrogen receptors in the tumor tissue. Designed to be used by women during the period of menopause. Since many forms of breast cancer are stimulated by estrogen, this drug is intended to decrease the quantity of estrogen in the blood, slowing the development of the disease in this way. In some experimental researchers, the level of estradiol in the blood decreases up to 98% of the initial concentration. 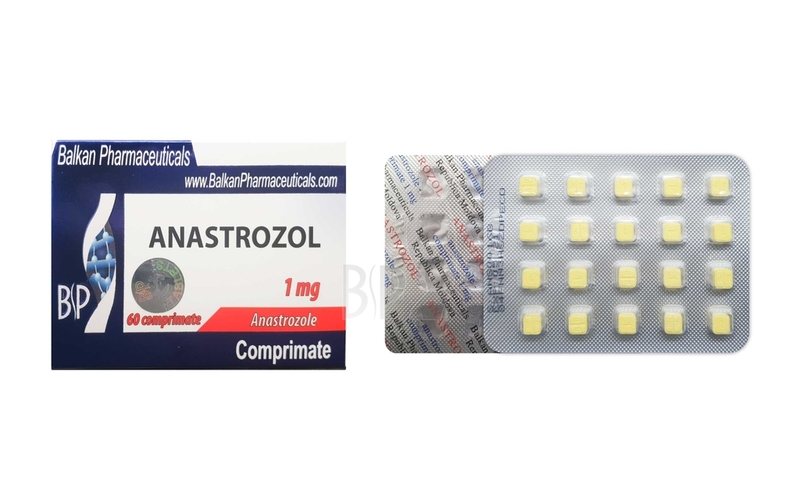 In bodybuilding, the active substance of the drug anastrozole is used for the prophylaxis of gynecomasty and fat accumulation, side effects due to the use of testosterone esters and other drugs with androgenic activity. It is recommended only to experienced and professional sportsmen who apply for courses with the esters of testosterone, Sustanon, and other drugs with androgenic activity. The cost of Anastrozole (Balkan) quite justifies itself because one tablet per day is enough. The administration is started either when the course of steroids is started or when first manifestations of aromatization are observed, using 0,25-1 mg daily. It is better to apply the drug at an empty stomach because it is absorbed faster and more completely from the gastrointestinal tract to the blood system. The maximum concentration in the blood is reached 2 hours after the administration. 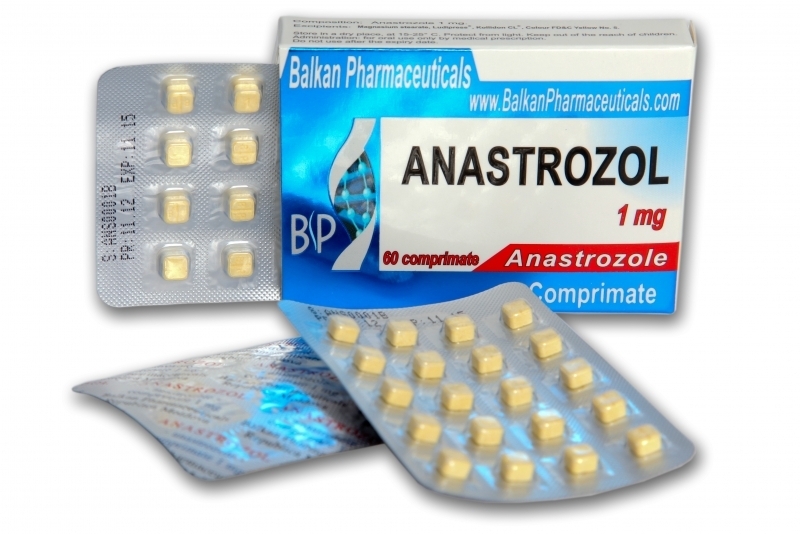 The course of Anastrozole (Balkan Pharmaceuticals) during 10-14 days decreases the side effects coming from heavy steroids courses, for example, 200-300 mg of testosterone propionate daily. The effectiveness of the drug is also confirmed by numerous clinical tests but due to the power of its effect it is not recommended to everyone. Detailed instruction to Anastrozole tablets is posted at our Forum where you may learn about an individual recommendation on drug administration. It’s desirable to administrate the drug at an experienced specialist’s control. The drug itself has androgenic and progestogenic activity, doesn’t affect the secretion of aldosterone and cortisol, doesn’t need the injection of corticosteroids during the course. Anastrozole has long half-life period (40-50 hours) and, even at small dosages, effectively prevents feminization manifestations at sportsmen. Excreted from the organism mainly with urine and bile. Does not affect the production of natural testosterone. Administration of more than 1 mg of the drug daily and during the long period is not recommended. With all its advantages, sportsmen distinguish two main disadvantages of the drug. The decrease of estrogen side effects is confirmed in all reviews about Anastrozole (Balkan) so that its effectiveness is quite proved. But during the process of active affect the drug suppresses also the synthesis of “good” cholesterol that is necessary for the cardiovascular system, this is the first disadvantage. Reviews about anastrozole and our Forum don’t recommend using the drug by those people who have problems with heart or vessels. Tamoxifen becomes an alternative in this case. In combination with finasteride the reviews about Anastrozole recommend using the drug for minimization of side effects of steroids that are converted to dihydrotestosterone. This affects the state of the musculature only in a positive way. After studying the reviews about Anastrozole, the second disadvantage could be named its relatively high price. The application of the drug pays off in the case of long course or courses with high doses of steroids. Price for Anastrozole is conditioned with the expense of synthesis of the drug itself and may often be higher than the price of the steroids themselves which, naturally, doesn’t make the bodybuilders happy. But it is no worth to economize on your health. Compare what is more profitable – price for Anastrozole or numerous visits to doctors and performing surgical operations fighting against gynecomasty.